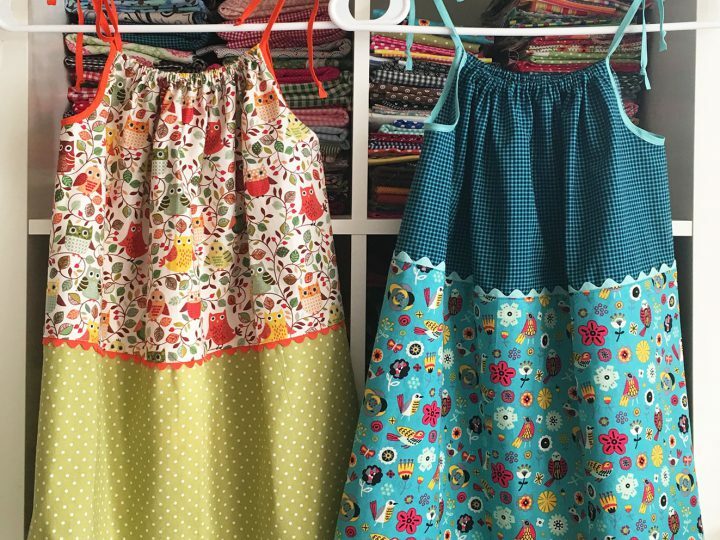 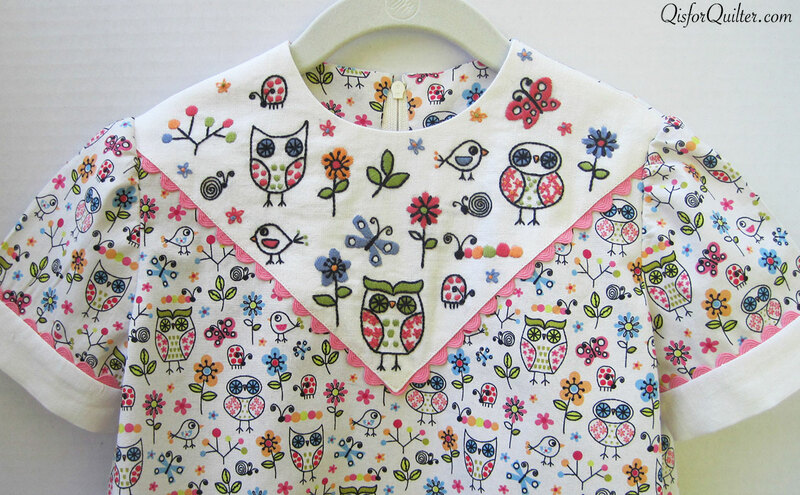 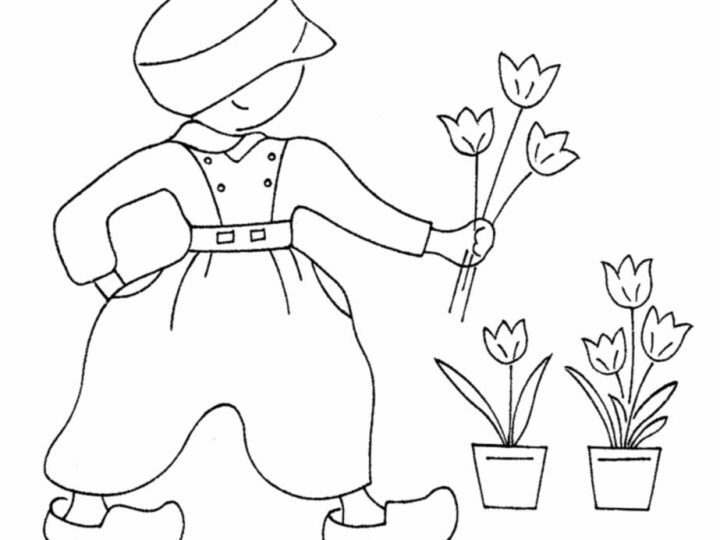 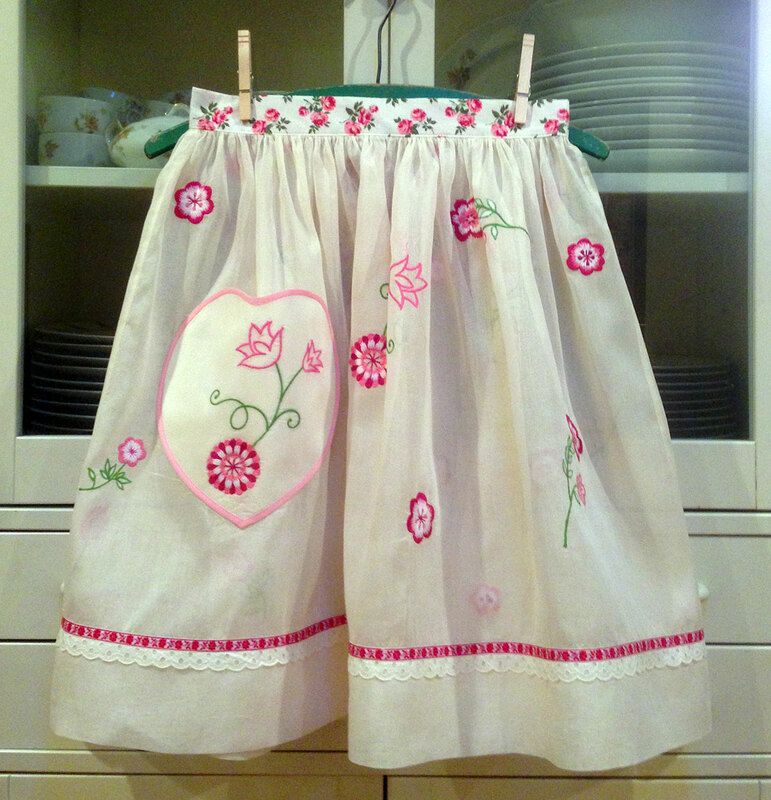 April Double Apron Giveaway — It’s Early! 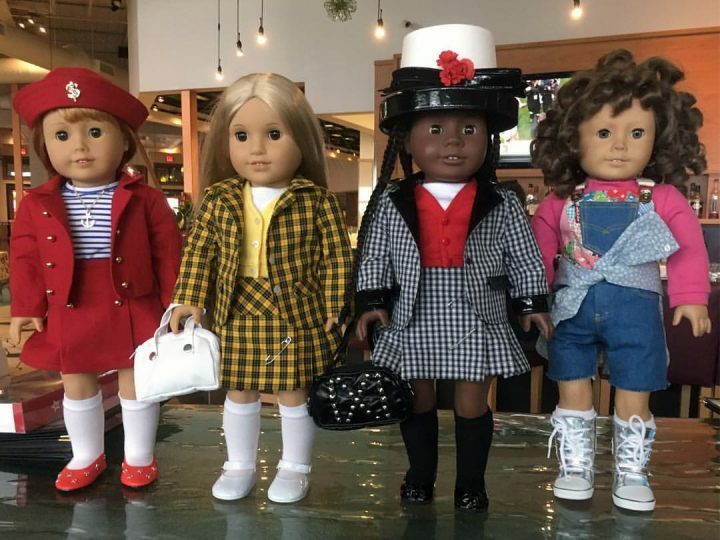 American Girl Dolls Dress up as Characters from Clueless. 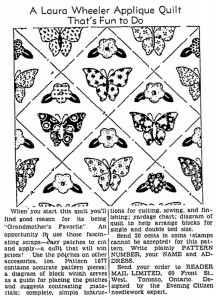 My friend, Patty (Petalier on Etsy), sent me an enormous box of vintage embroidery transfers, many of which were the large format designs from Laura Wheeler and American Weekly. 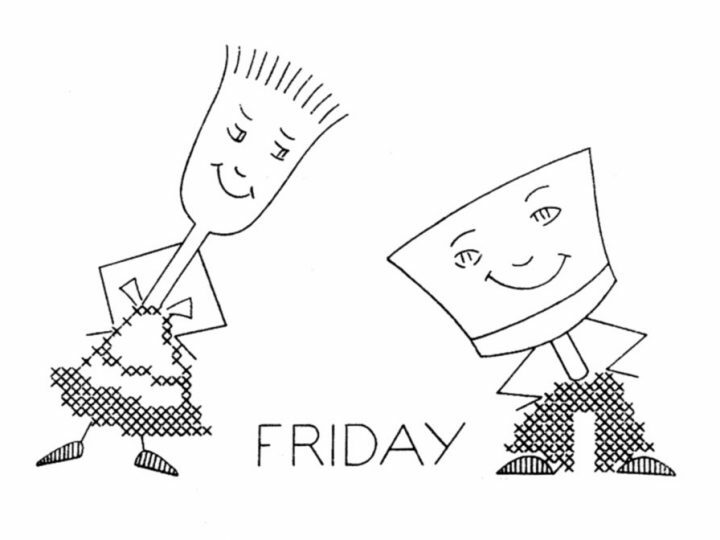 I am in the process of scanning the transfers and will be posting them soon. 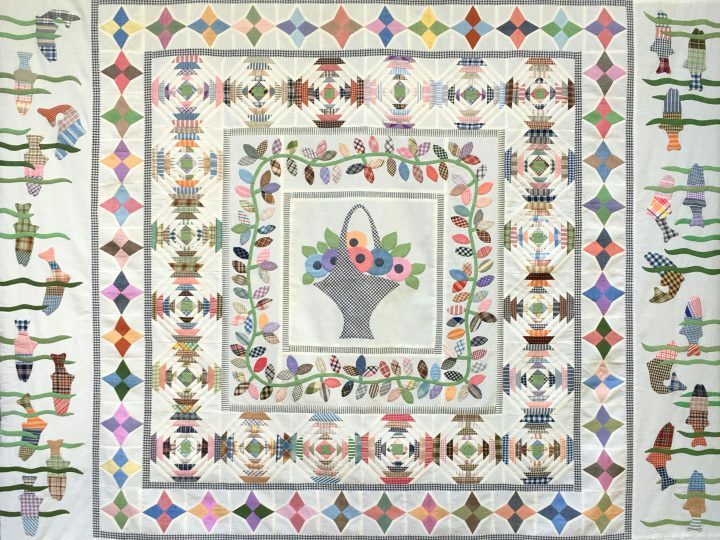 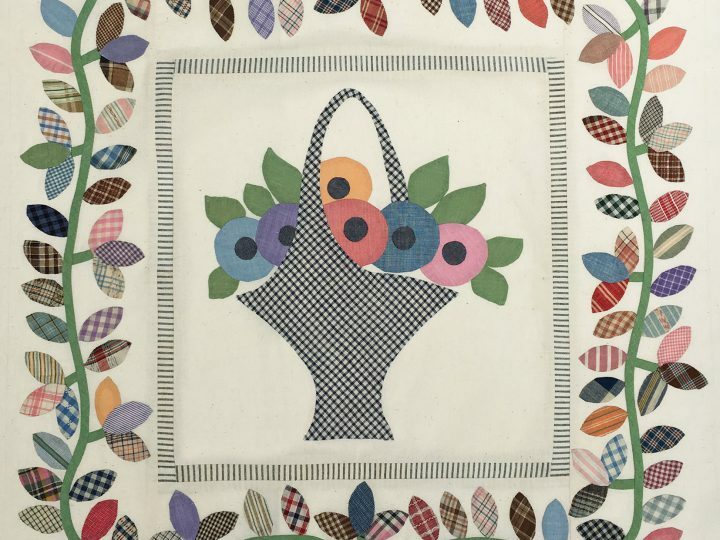 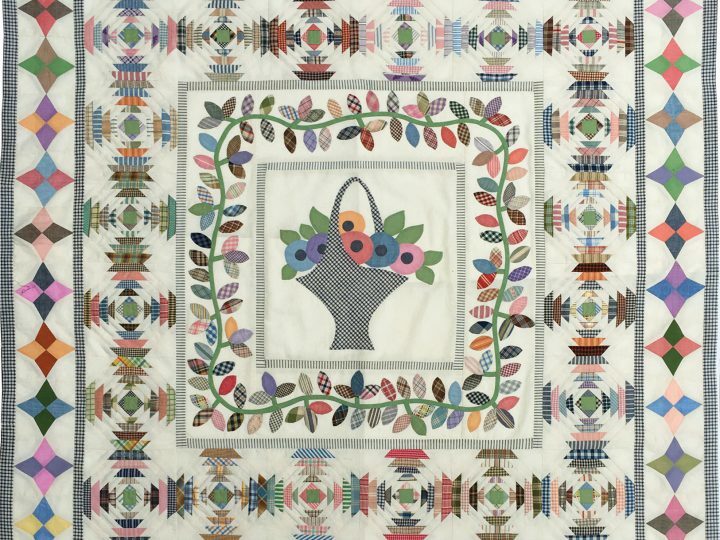 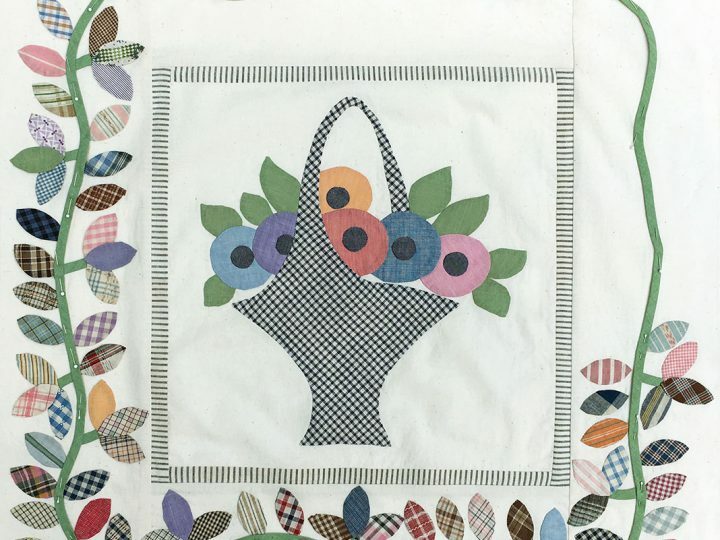 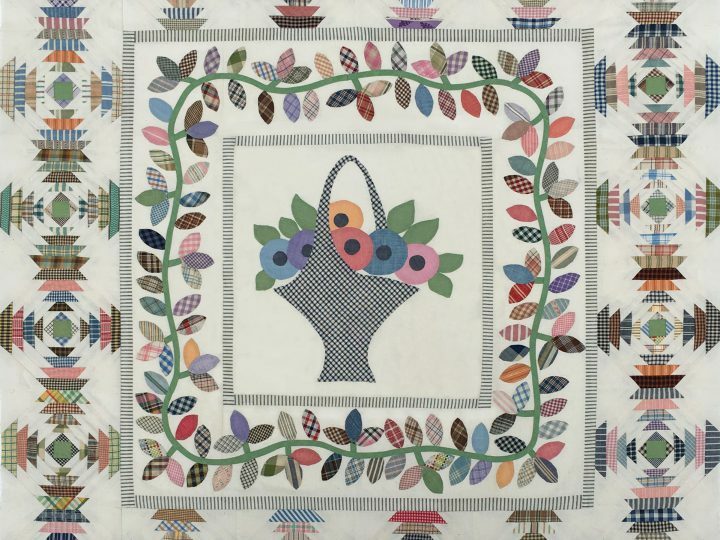 Tucked in among the transfers was this timely and pretty quilt pattern, Flower of Spring, which shares a name with the KC Star appliqué pattern. 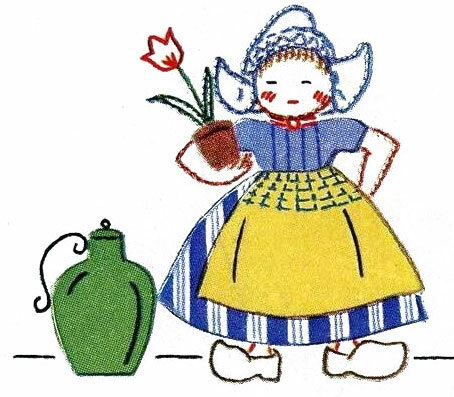 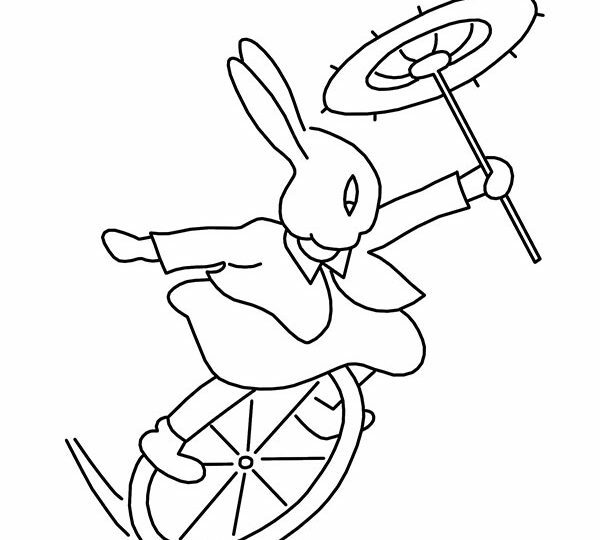 Since our forecast is for sunny weather all week in Seattle, I am feeling rather springy today. 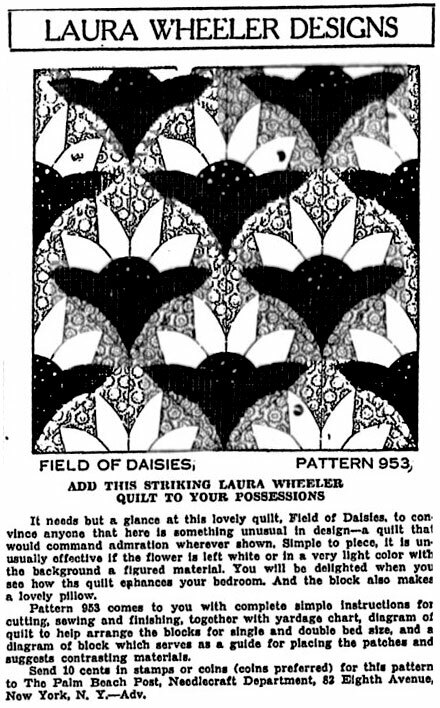 Laura Wheeler was just one of the pseudonyms used by Needlecraft Service, Inc., a mail order pattern company located in NYC. 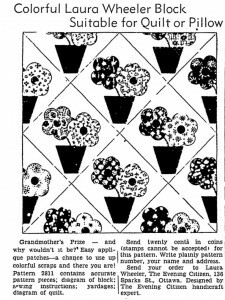 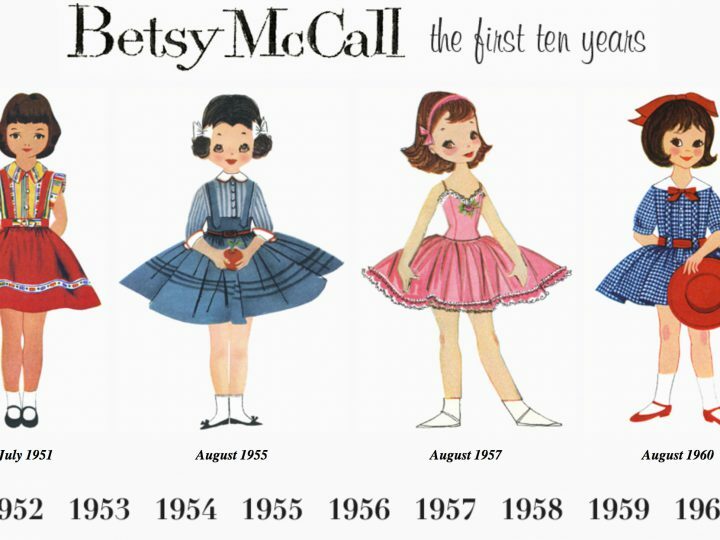 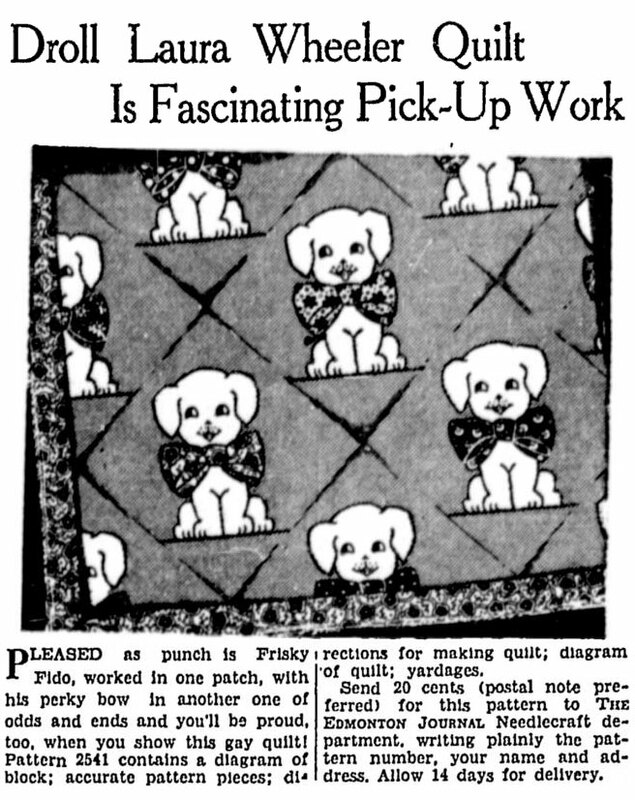 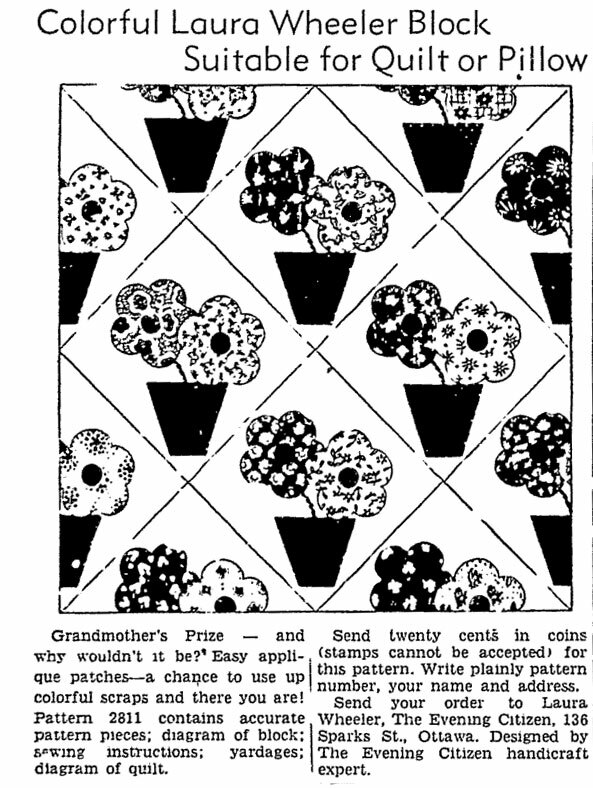 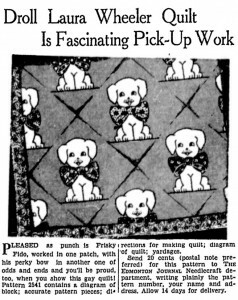 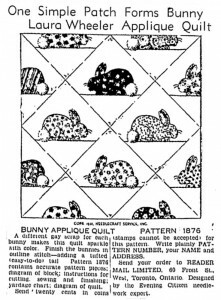 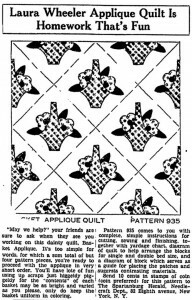 The heyday for these patterns must have been the 1930s and 40s, because that’s the period I found most of their ads in archived newspapers. 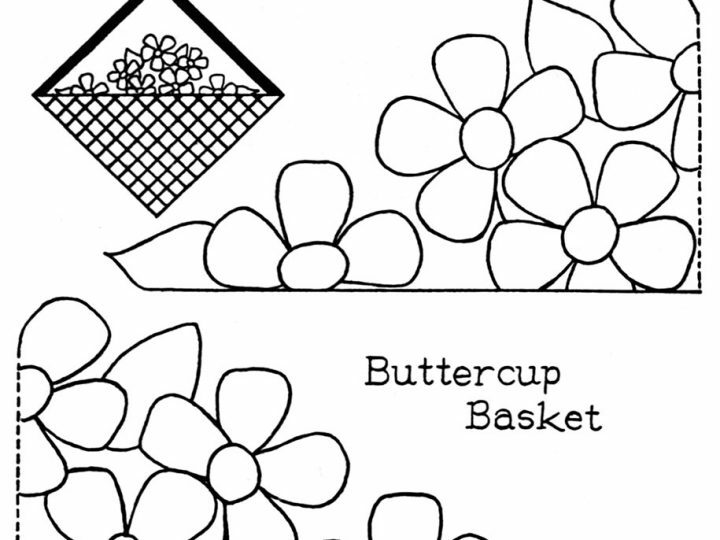 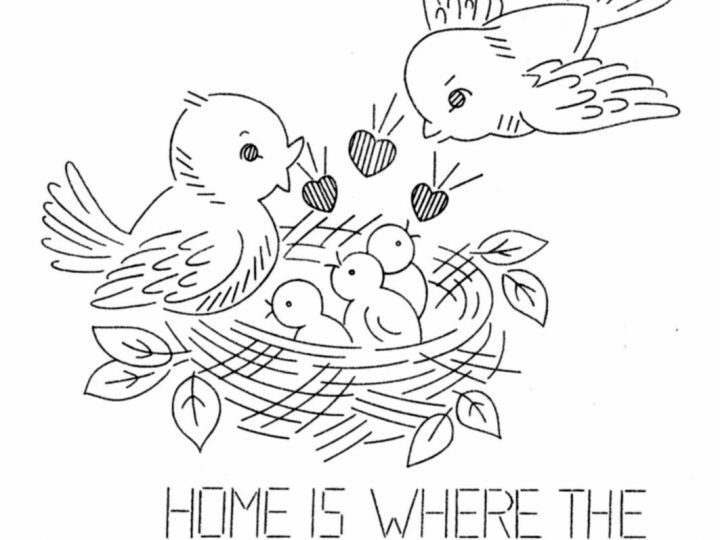 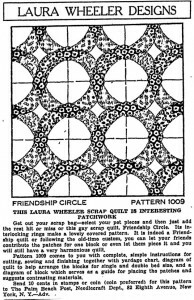 Under the Laura Wheeler name, Needlecraft Service, Inc. published patterns for quilting, crochet, knitting, embroidery and sewing. 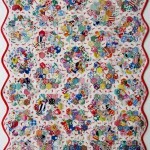 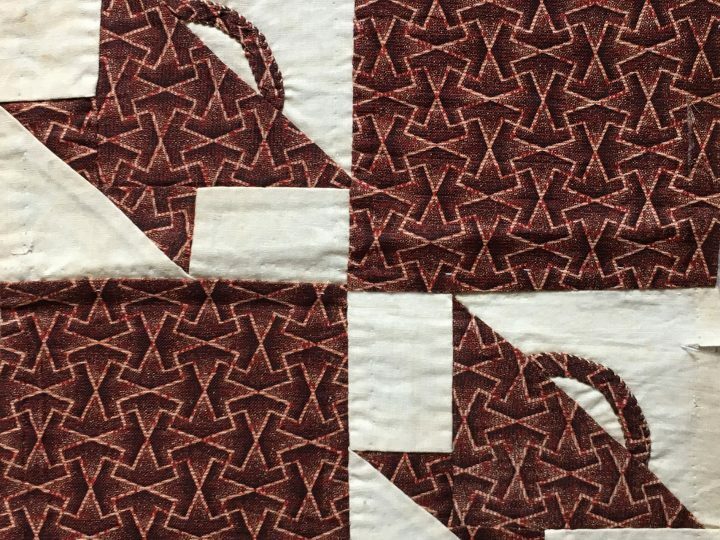 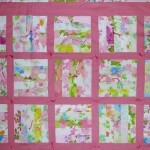 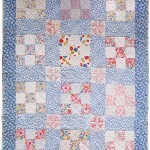 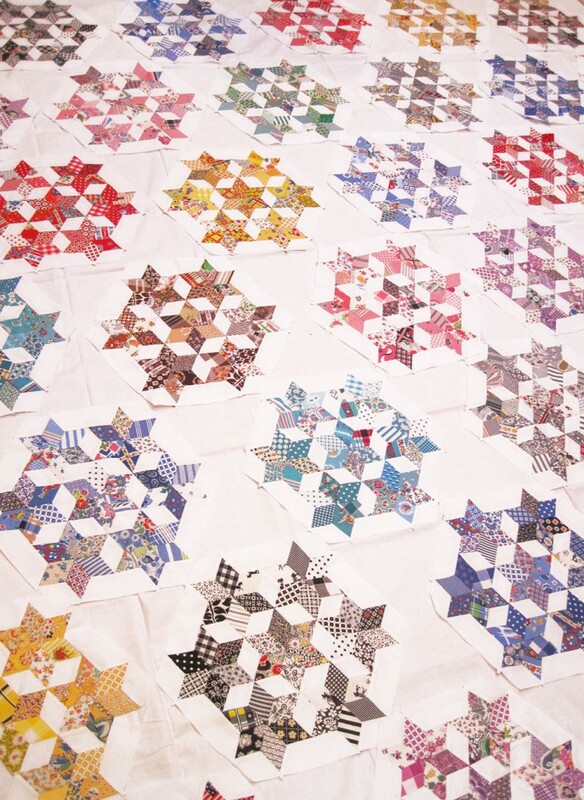 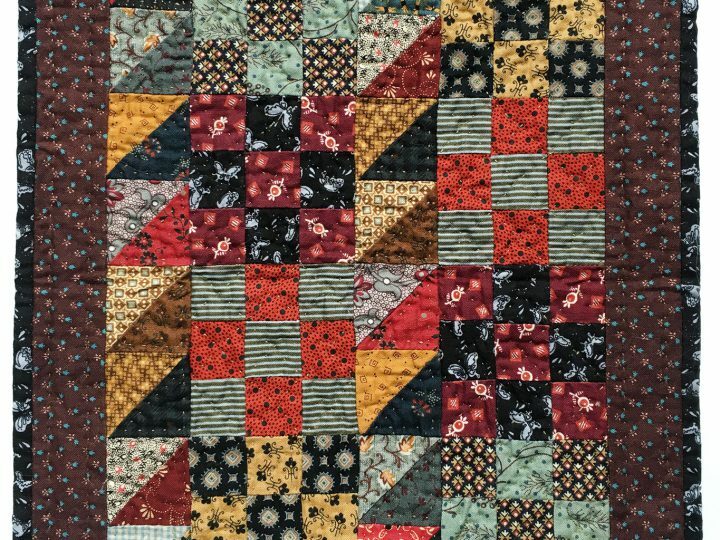 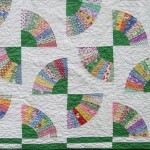 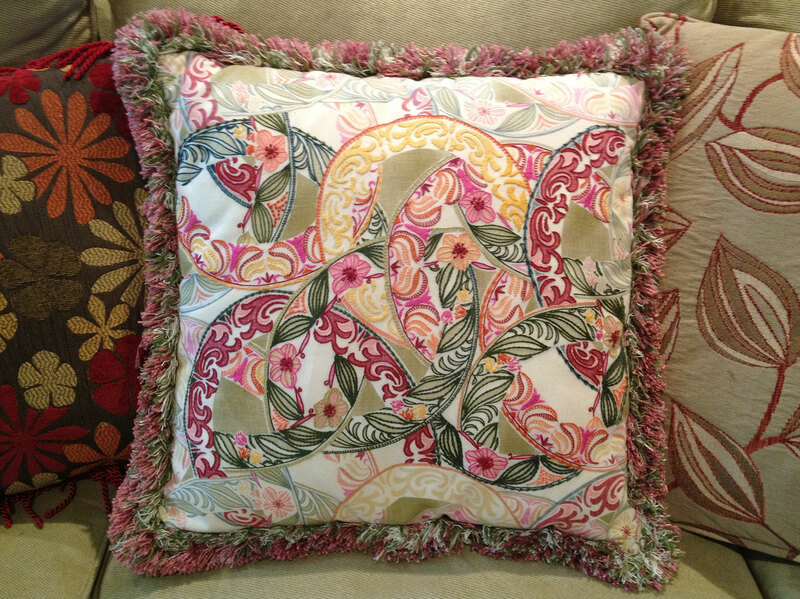 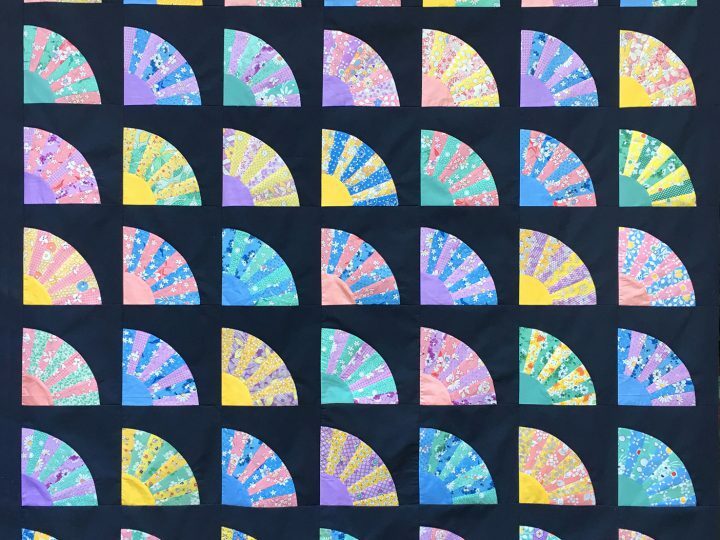 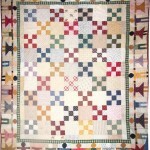 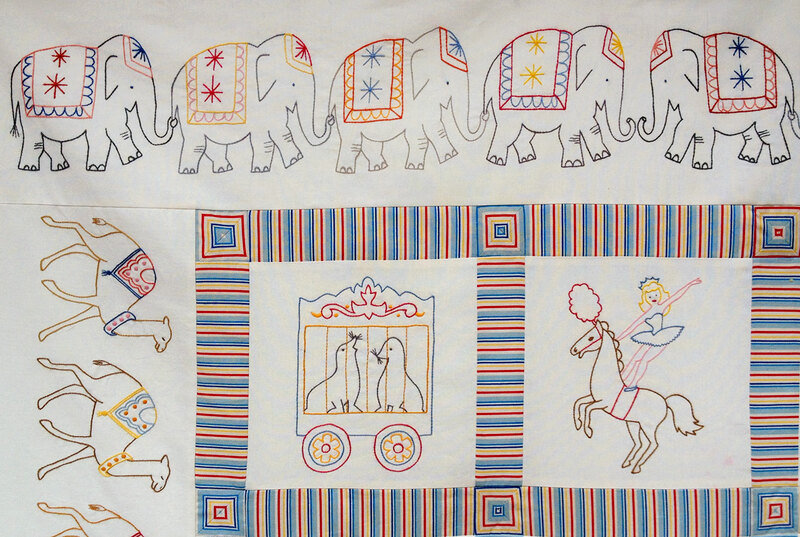 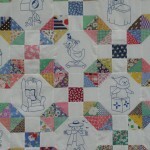 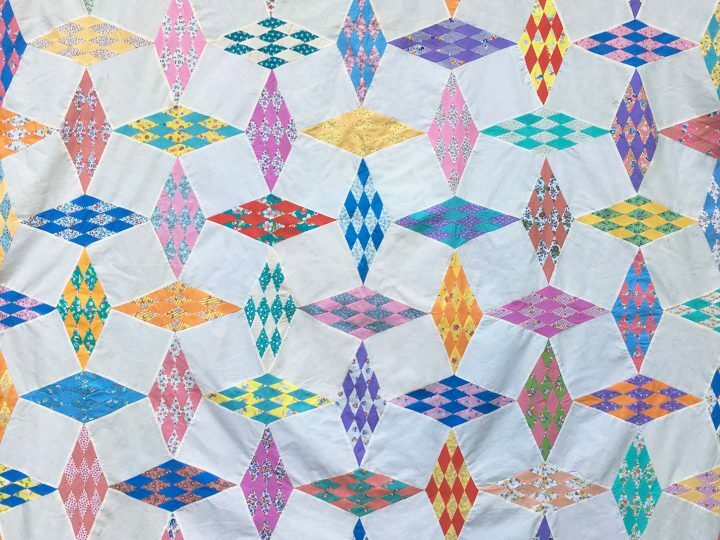 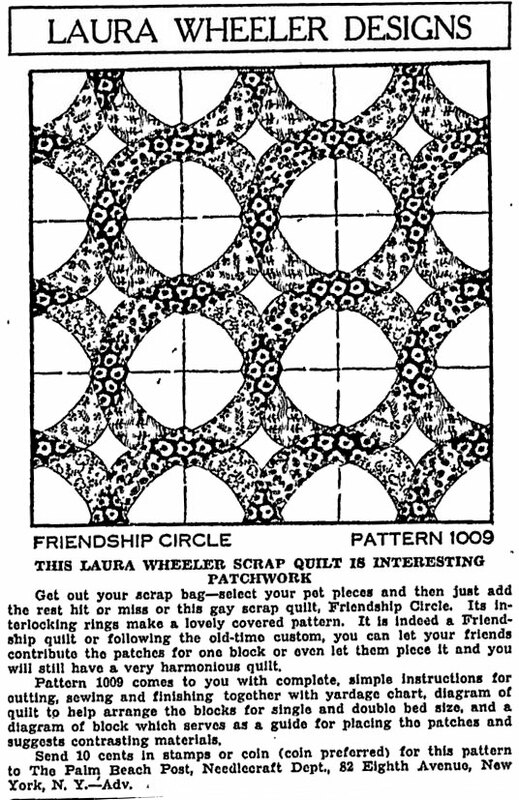 LW quilt patterns are generally complex, with many pieces, curves and set-in seams — just the type of patterns I love. 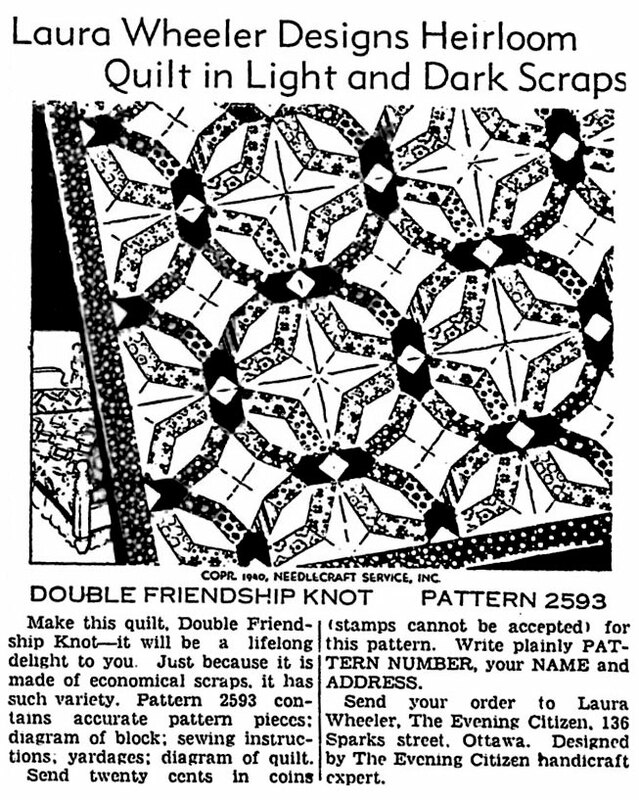 Also, lots of them are perfect for scrappy type quilts, which is another plus for me. 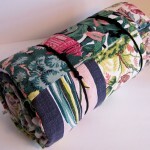 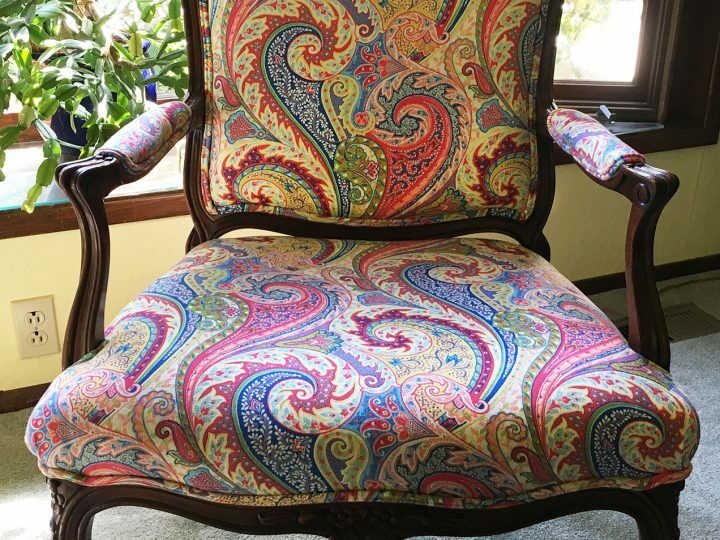 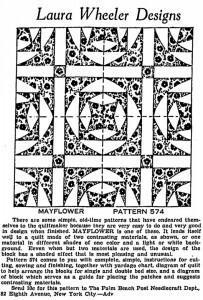 The original pattern sheet is large at 18″ x 24″ and gives two choices of fabric width (32″ and 34″), so you would need a little less yardage if you’re using modern fabric. 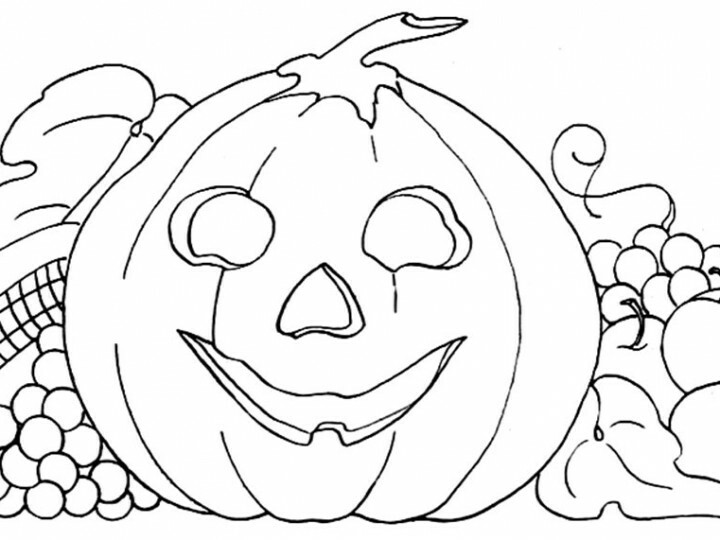 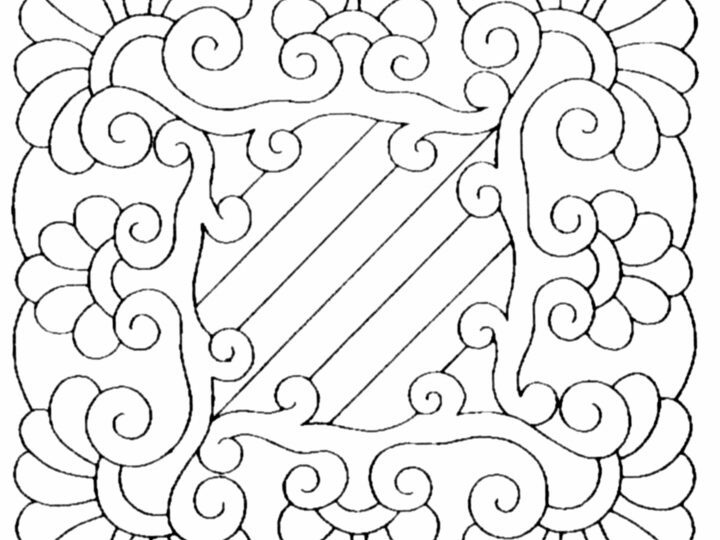 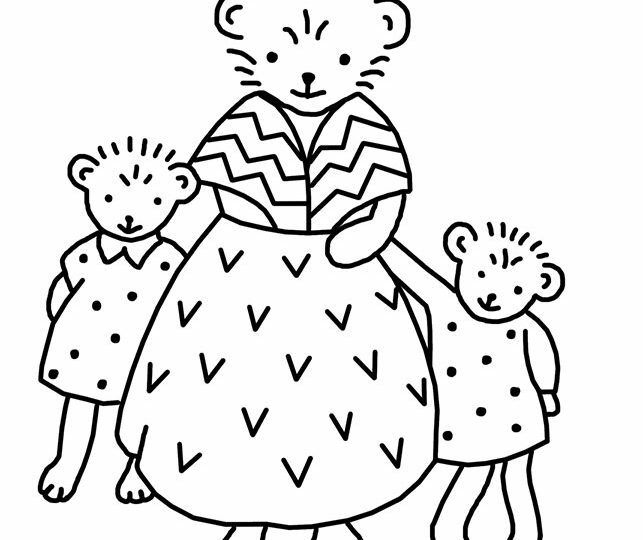 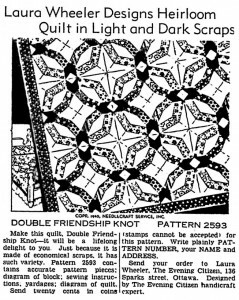 Because people sell photocopies of these patterns for ridiculous amounts of money, I have watermarked the high resolution image. 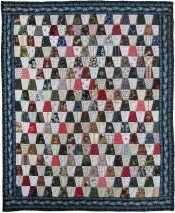 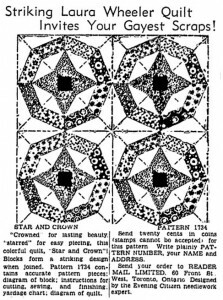 Other large images of Laura Wheeler quilt patterns are available in earlier posts: Wreath, Joseph’s Coat, and Star of the Night. 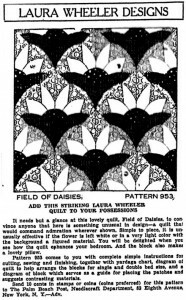 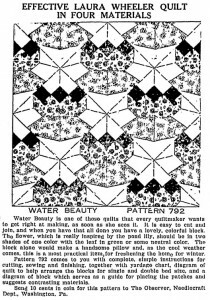 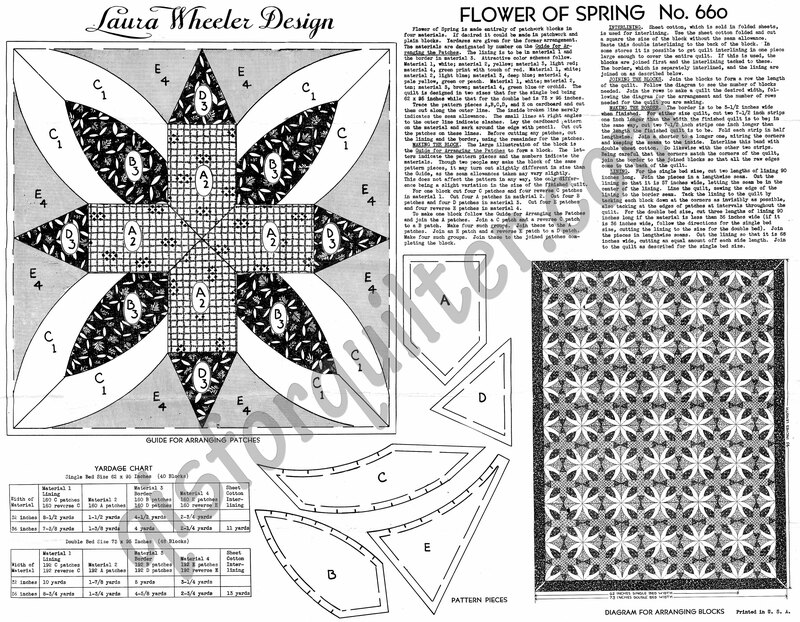 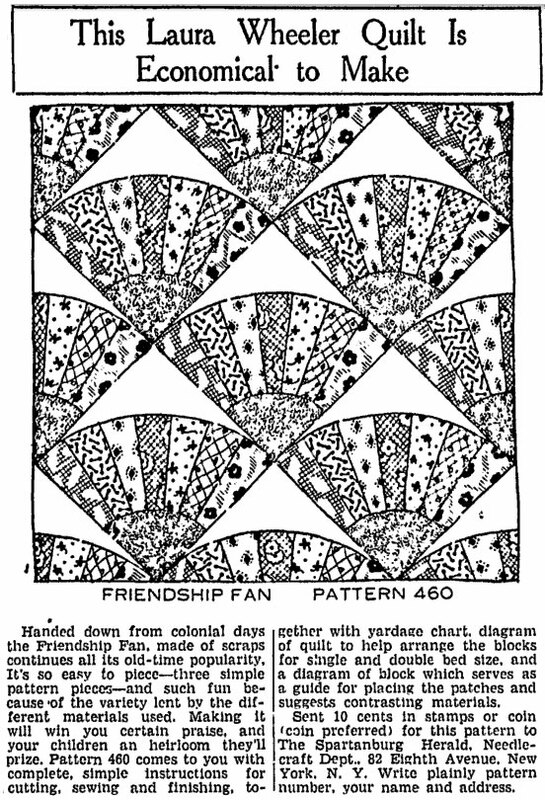 Below the pattern is a gallery of newspaper clippings of other Laura Wheeler patterns. 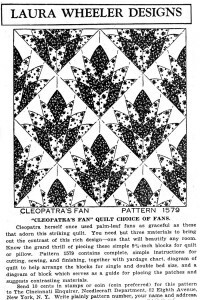 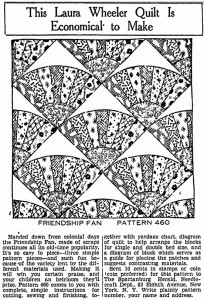 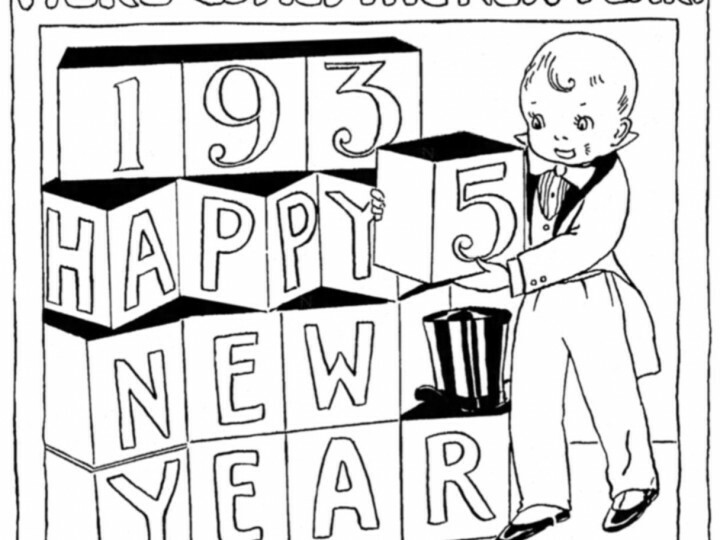 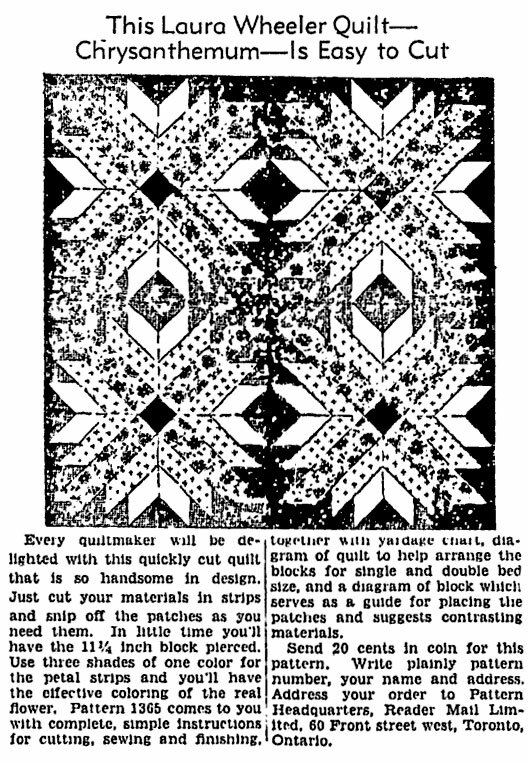 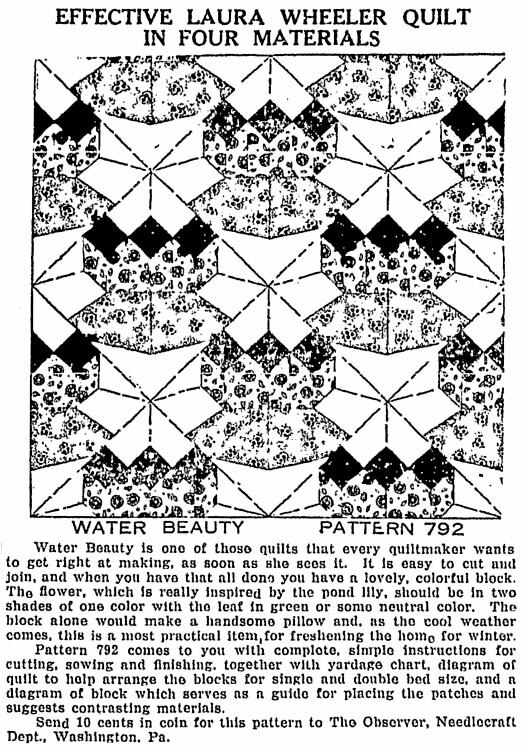 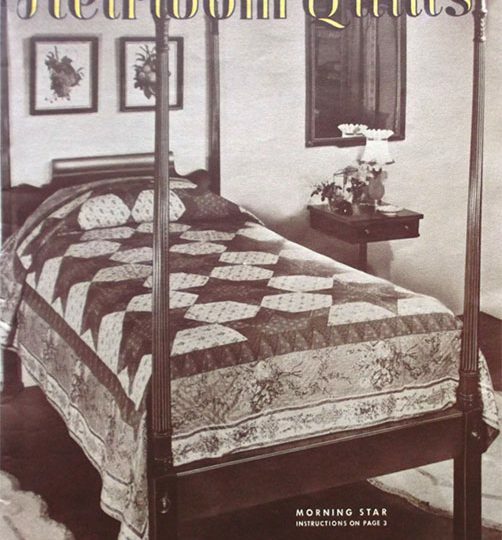 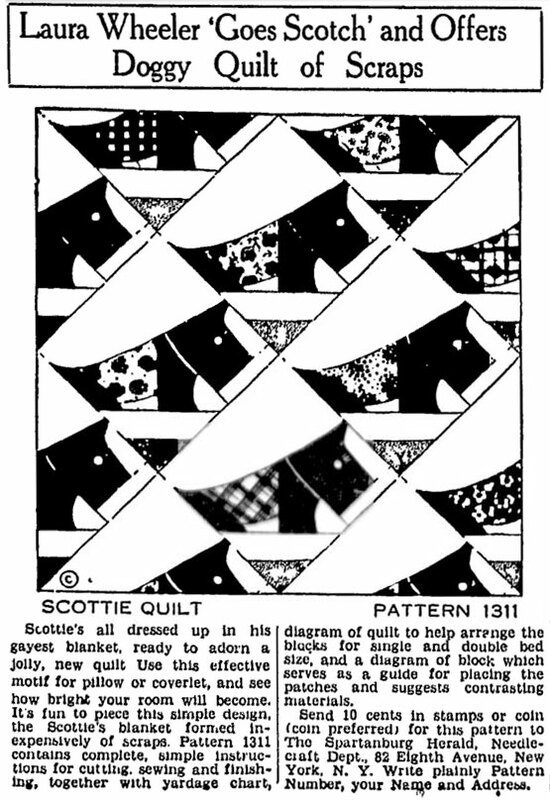 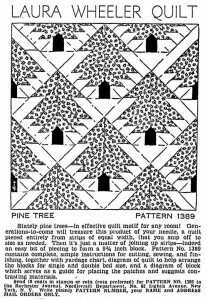 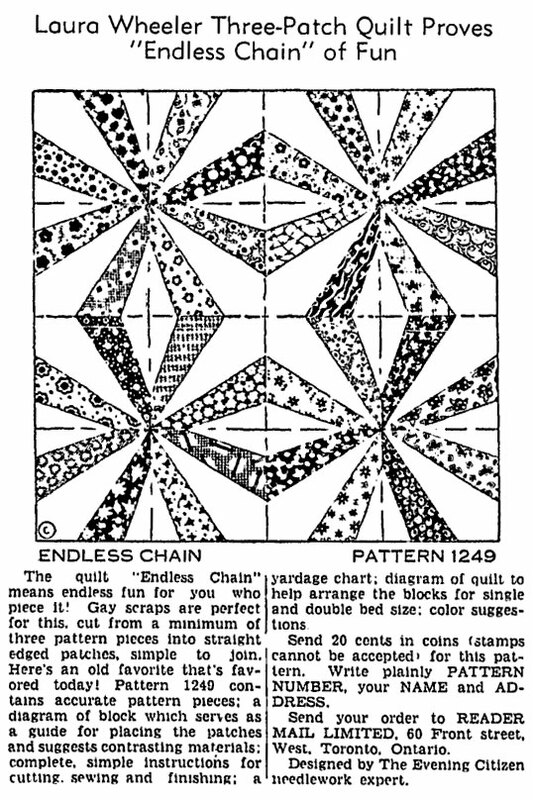 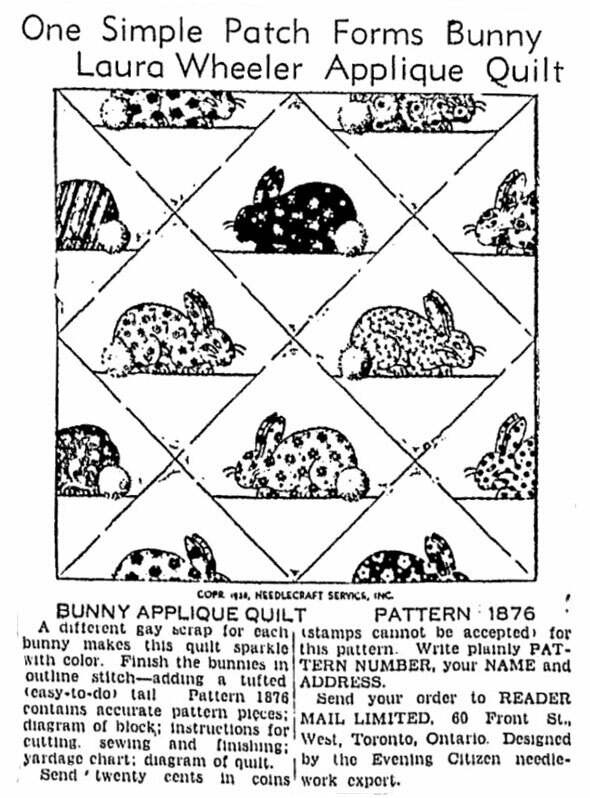 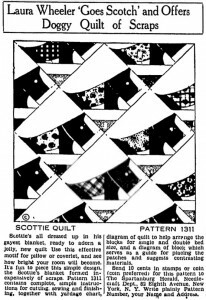 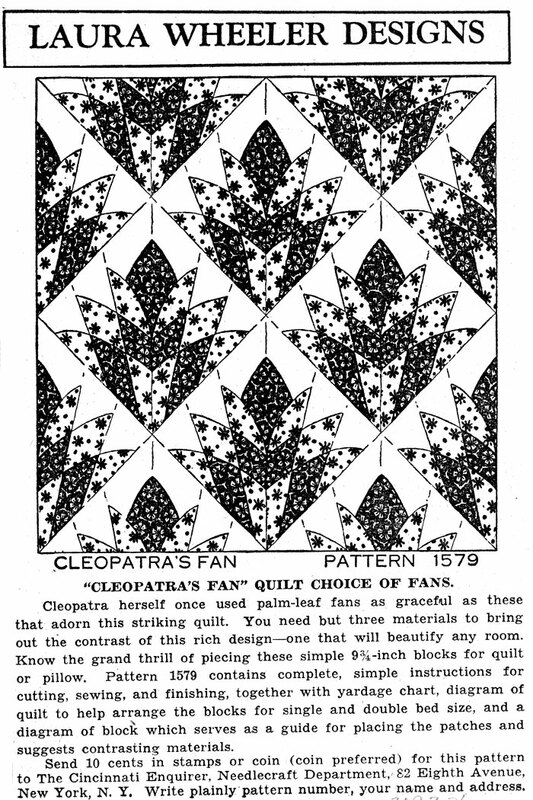 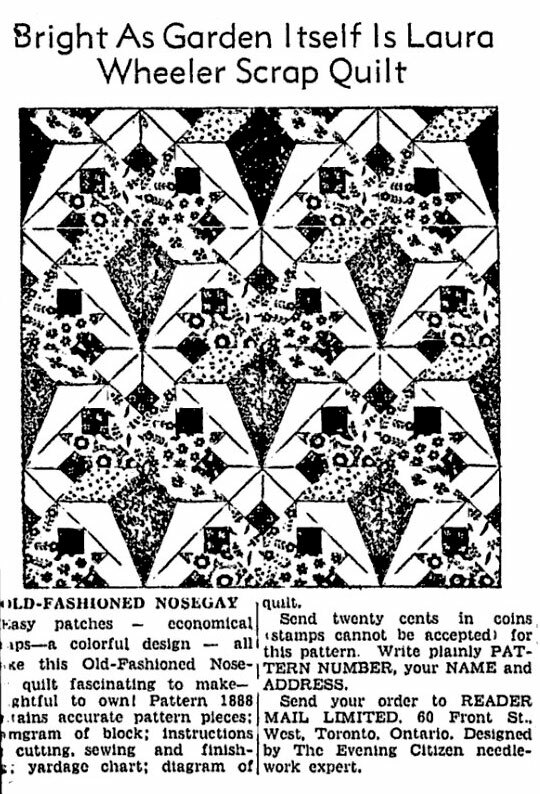 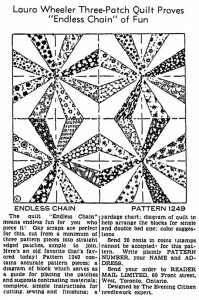 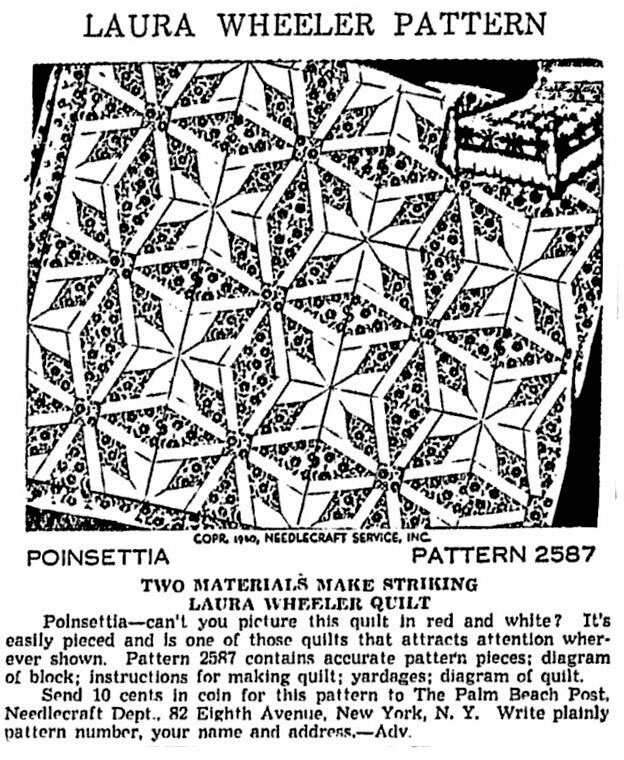 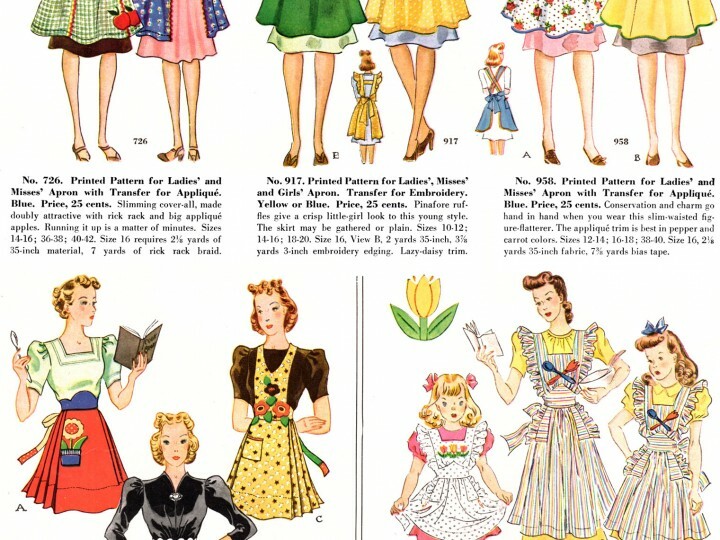 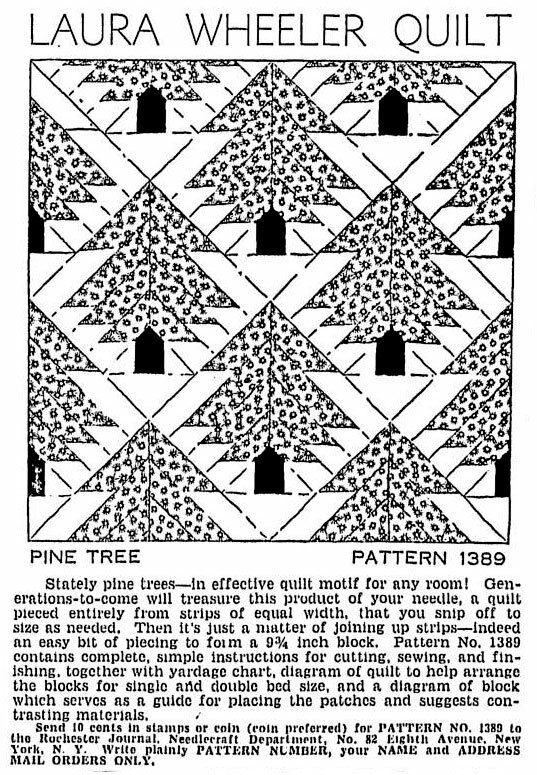 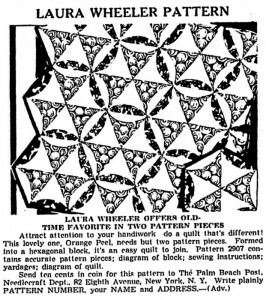 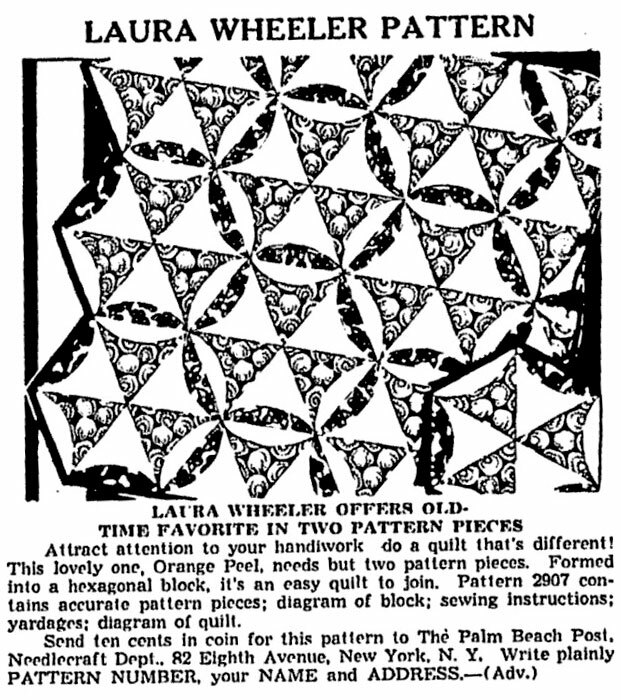 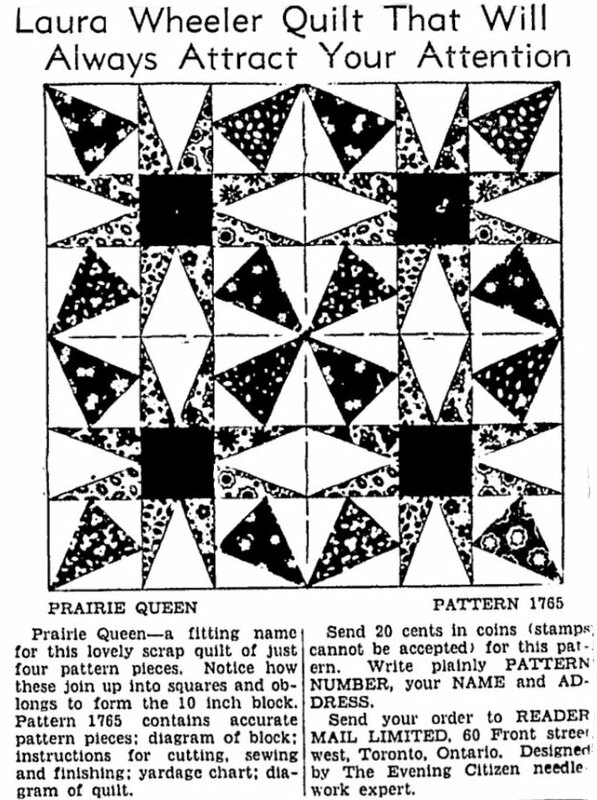 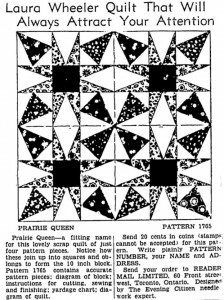 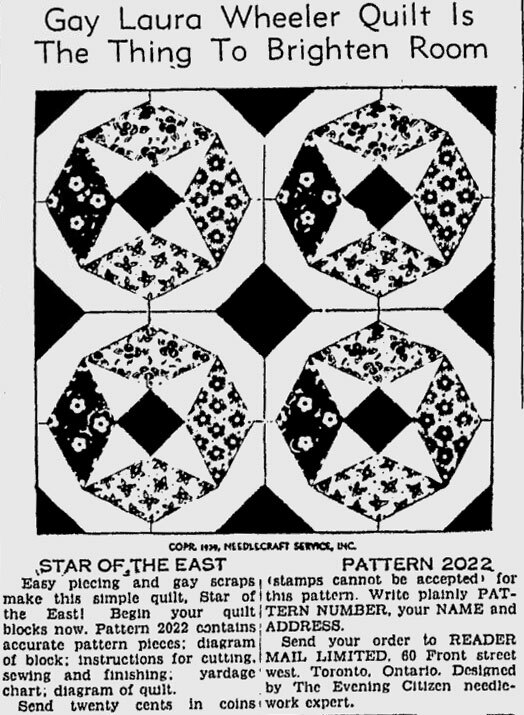 If, like me, you enjoy drafting your own patterns, these old ads are a wonderful resource; and if you’ve never made a quilt using templates and hand piecing, maybe one of these patterns will inspire you to try. 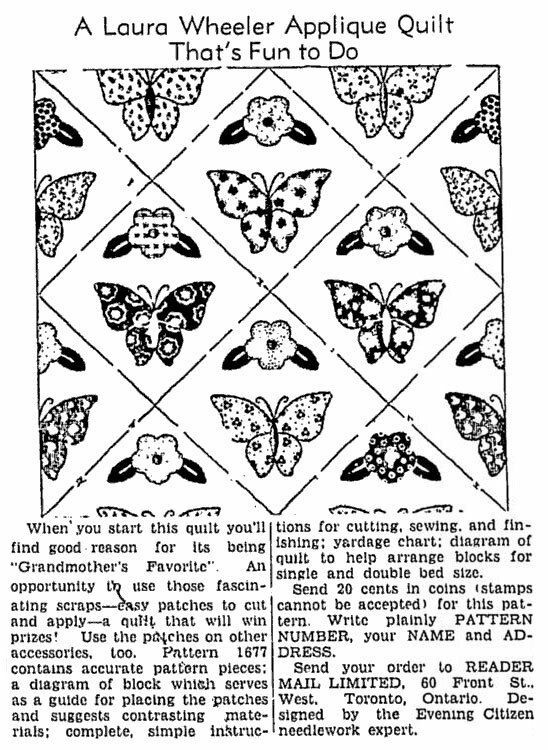 This project began with a box of vintage salesmen sample swatches — probably from the 1940s or maybe the 1950s. 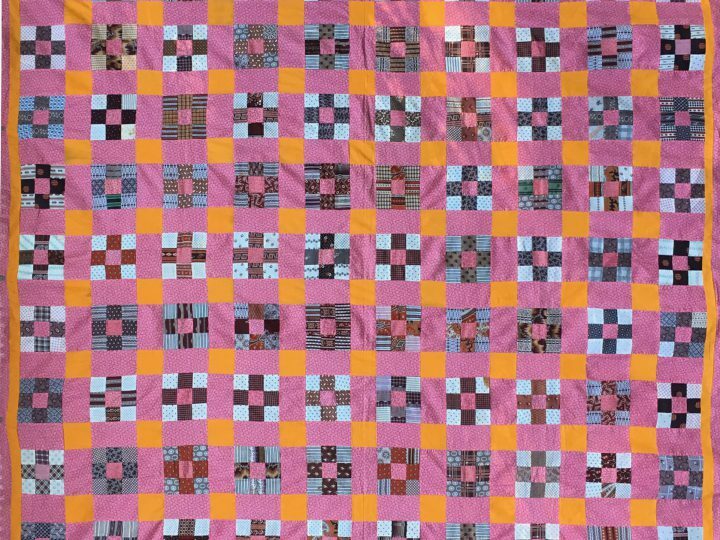 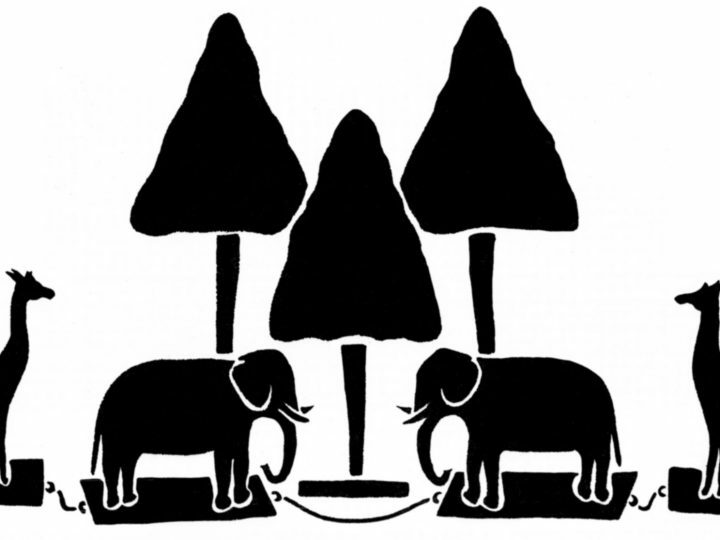 There were hundreds of prints (some with duplicates and different colorways), and all of the pieces were the same size (1 3/4″ x 3″) with a pinked edge. 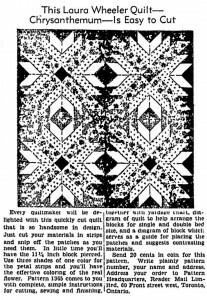 I drew a pattern of how I wanted to set the blocks and computed that I would need 1,488 printed diamonds, plus 936 various white pieces. 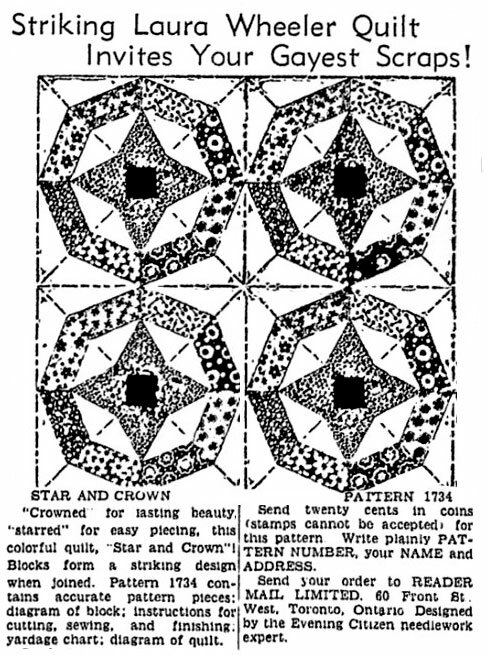 I sorted the swatches into color groups of 42 for each block, and then into sets of 6 for each of the 7 stars. 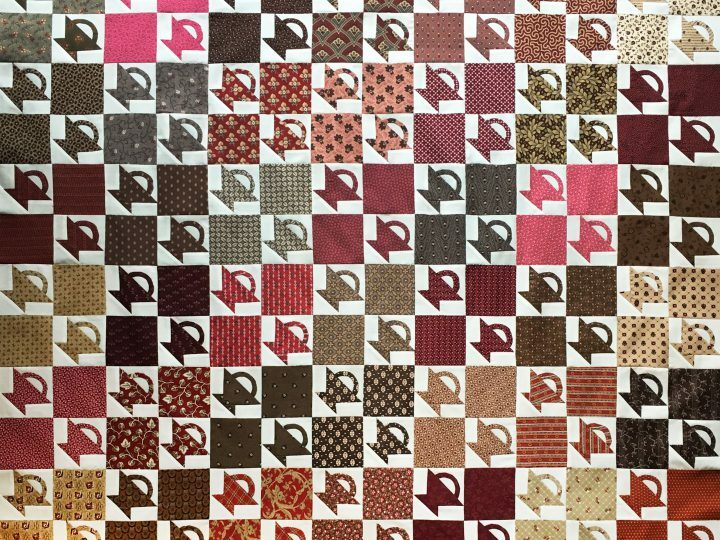 Some of the prints have light backgrounds, so I tried to arrange the various light and darker prints to make sure each finished block would read a particular color. 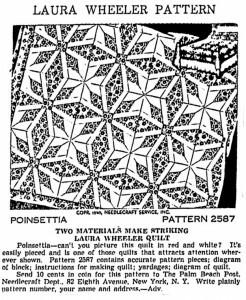 Now, finally, all hand piecing of the blocks and half blocks is done and I can start putting the top together with the setting triangles. 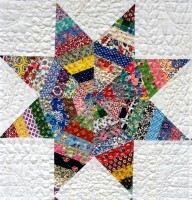 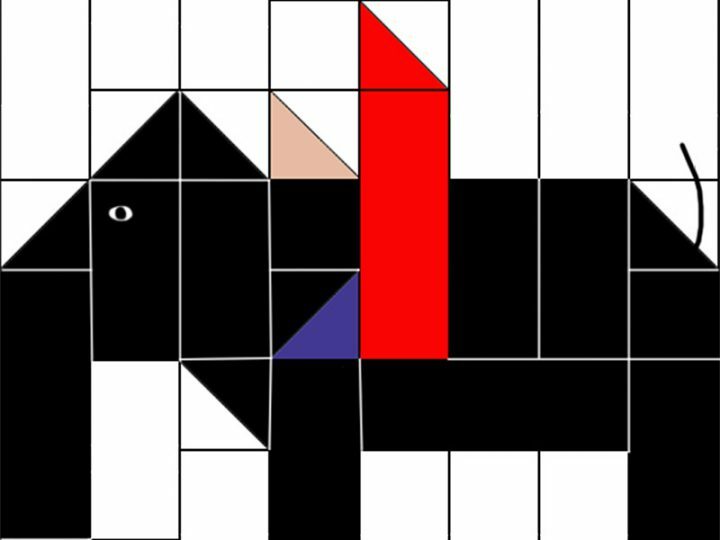 Although I initially thought solid color triangles would look nice, I’ve since changed my mind and I’m going with white. 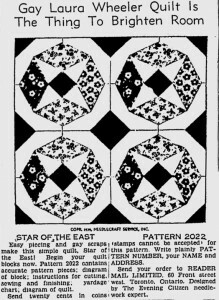 Somehow the star effect created by the colored triangles seemed to detract from the sisters blocks, which I think should be the main focus. 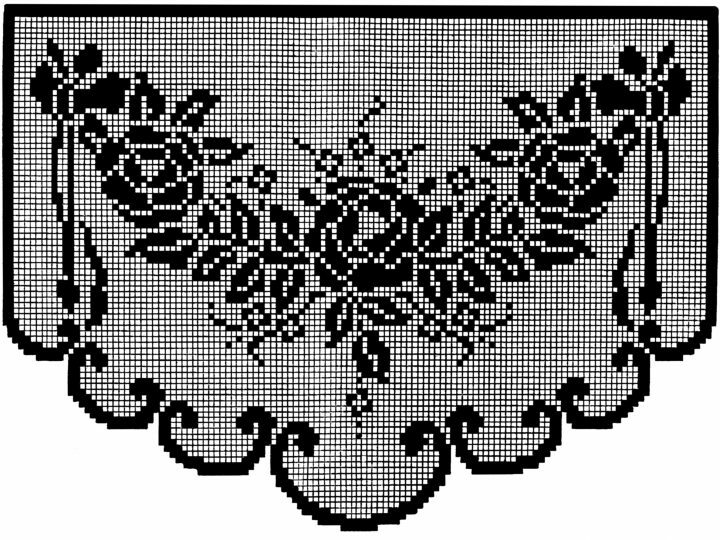 I’m planning on finishing up the top on the machine, so hopefully it won’t take too long. 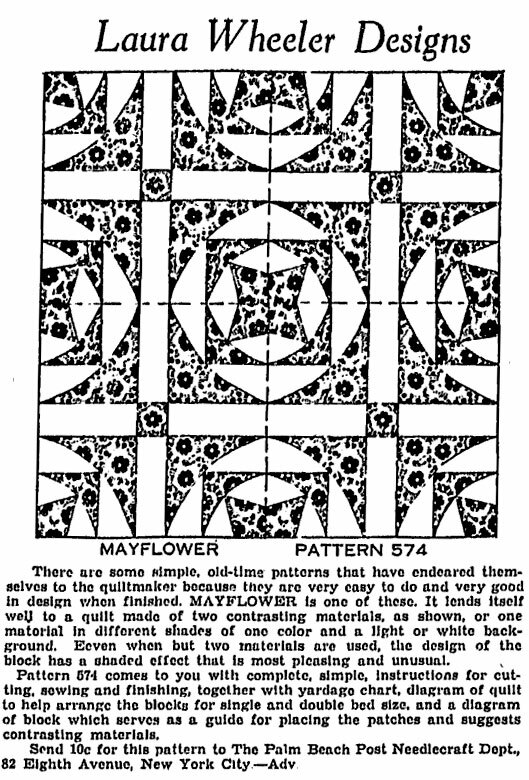 My wall isn’t big enough to lay out the 32 blocks and 6 half blocks, so I just arranged them on a sheet on the floor. 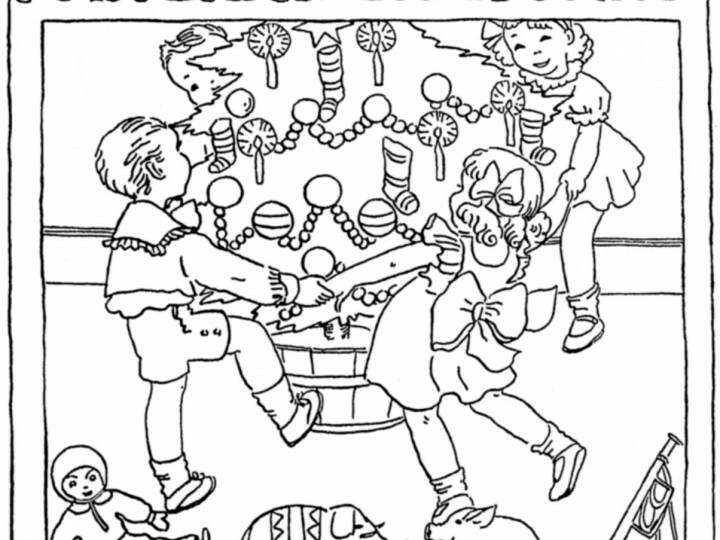 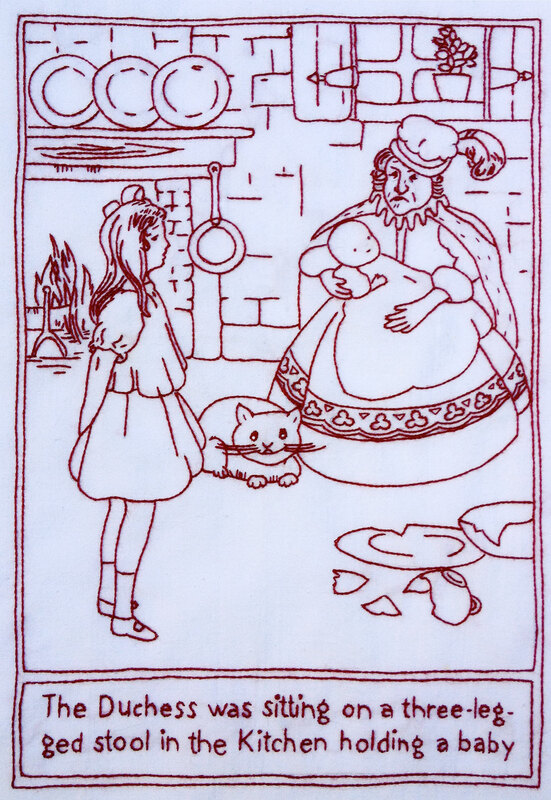 Although it’s a little difficult to make out in this busy print with it’s unusual color scheme, this is actually a Christmas apron panel. 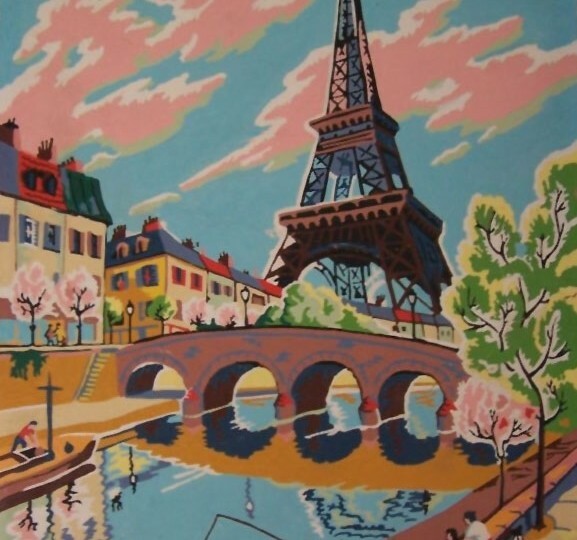 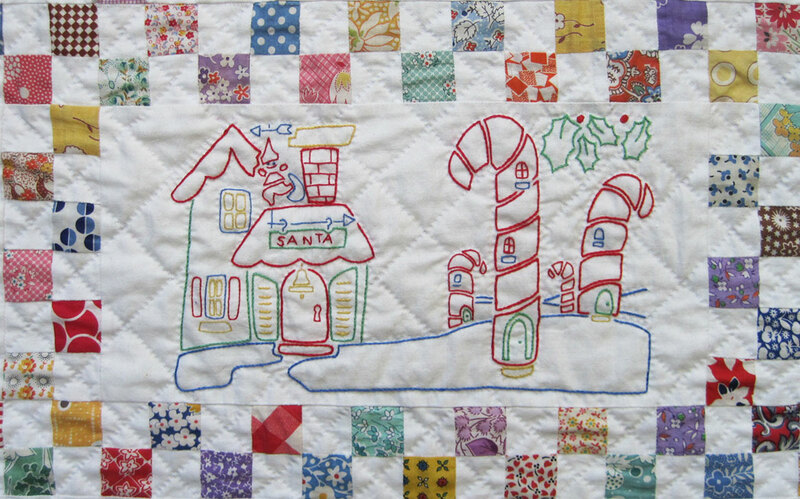 It was another interesting gift from my friend, Patty, who has a wonderful Etsy shop, Petalier, where she sells her beautiful quilts, along with vintage sewing-related items. 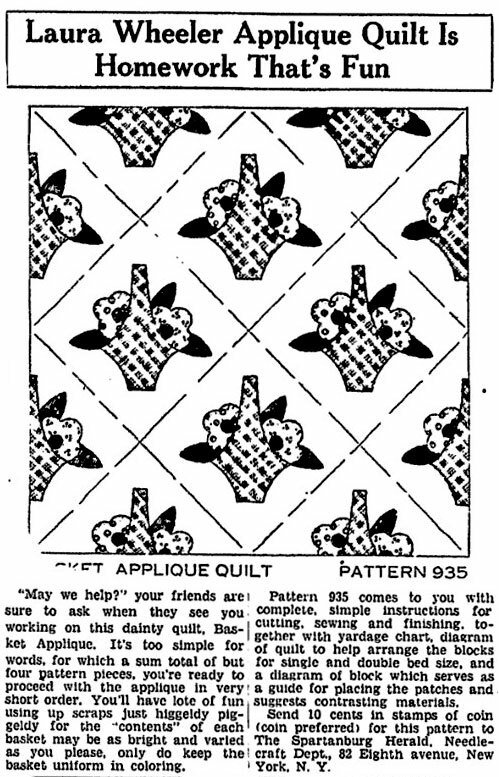 The panel was mostly cut, except for one pocket and ruffle where the directions were printed. 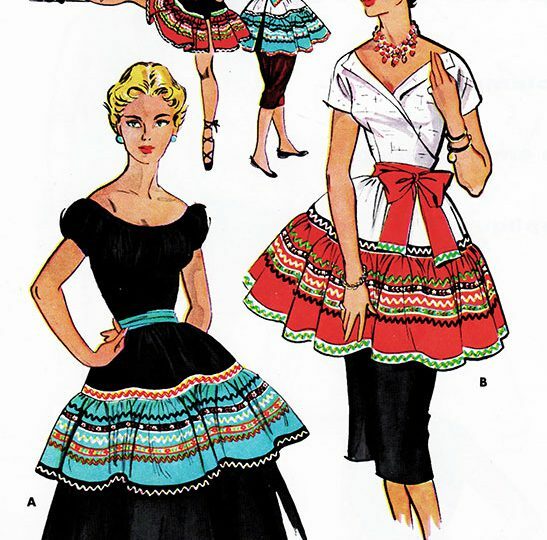 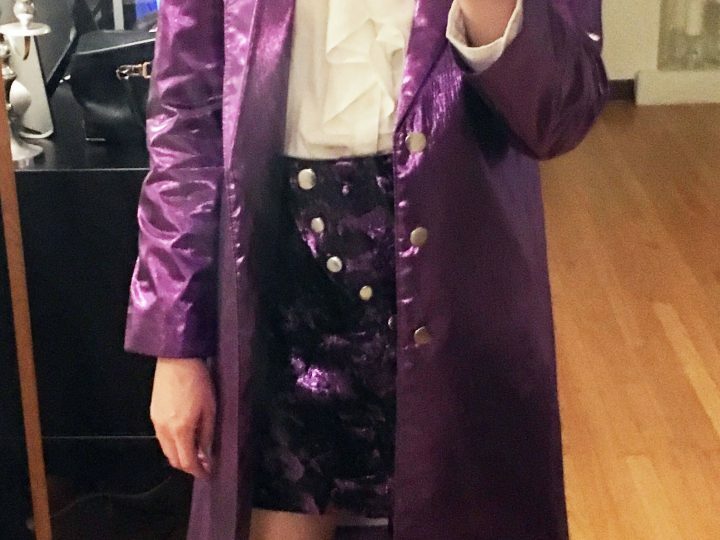 Unfortunately, one pocket ruffle was missing, as well as one sash tie (front and facing). 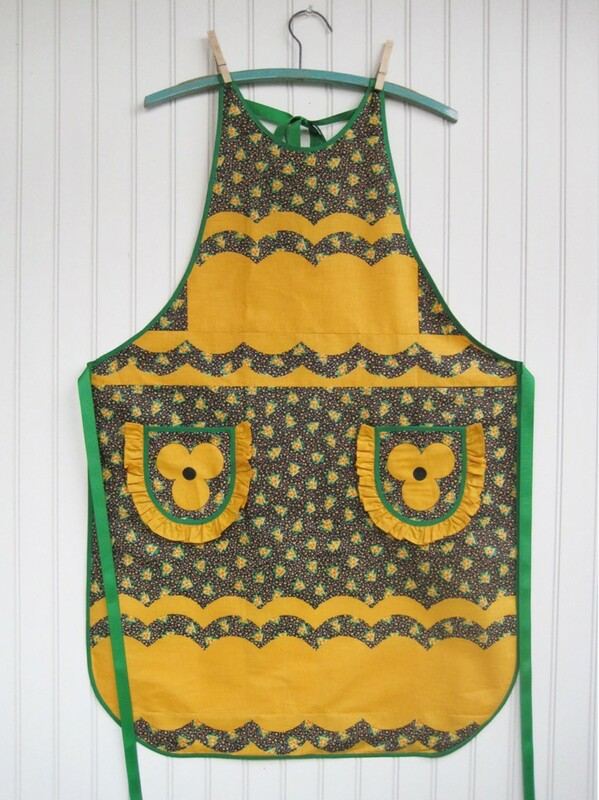 The apron was obviously not going to be made exactly as intended. 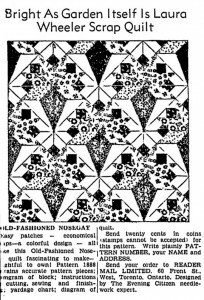 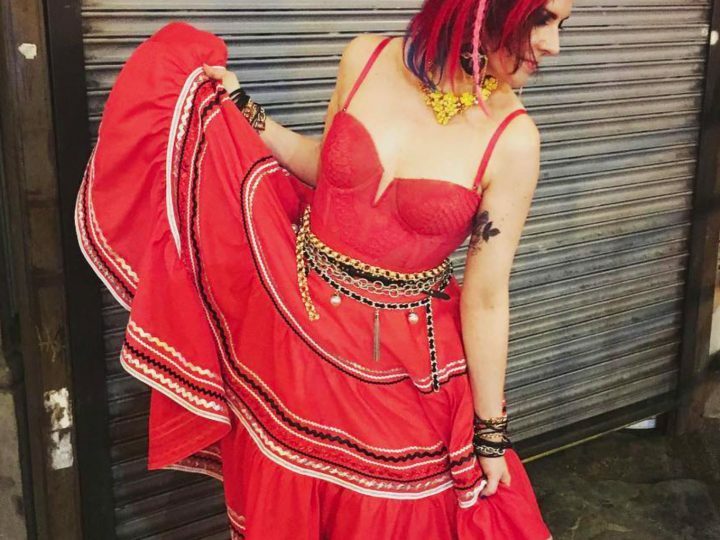 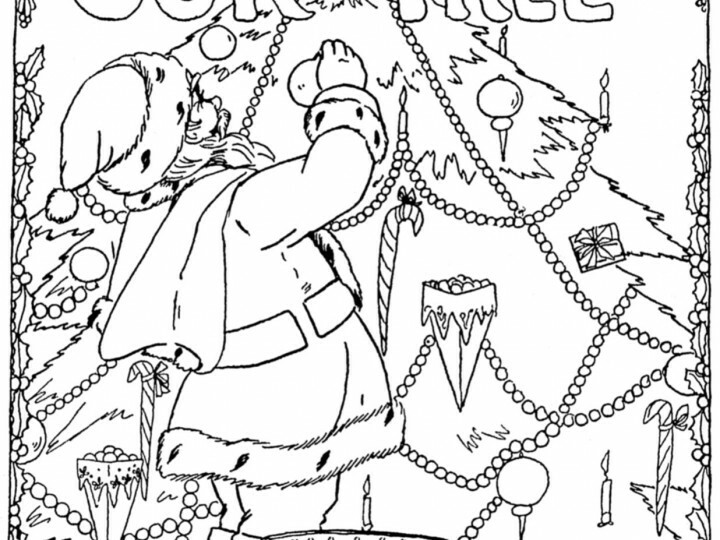 Patty knows I love this sort of challenge, and I immediately started brainstorming how I was going to alter the design. 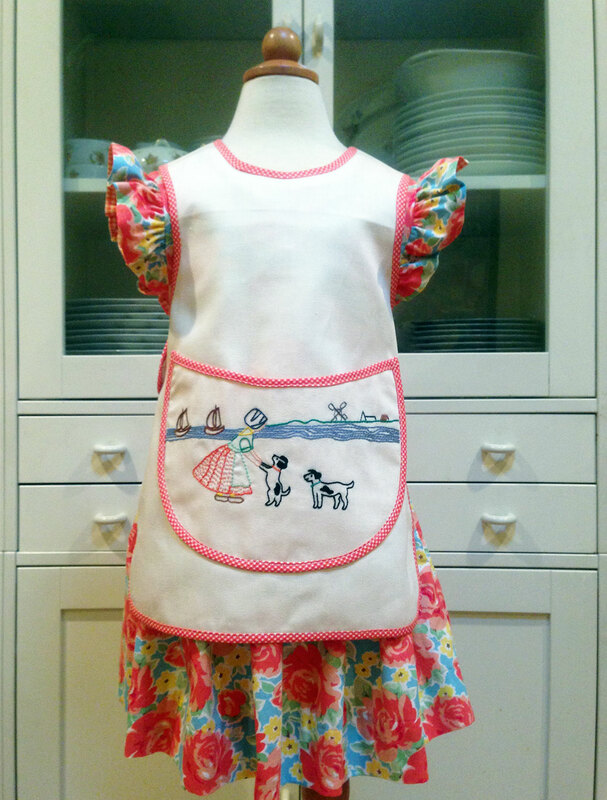 Since I’ve recently been into making 1920s style aprons, I decided to mix up the various elements and turn this into a full apron. 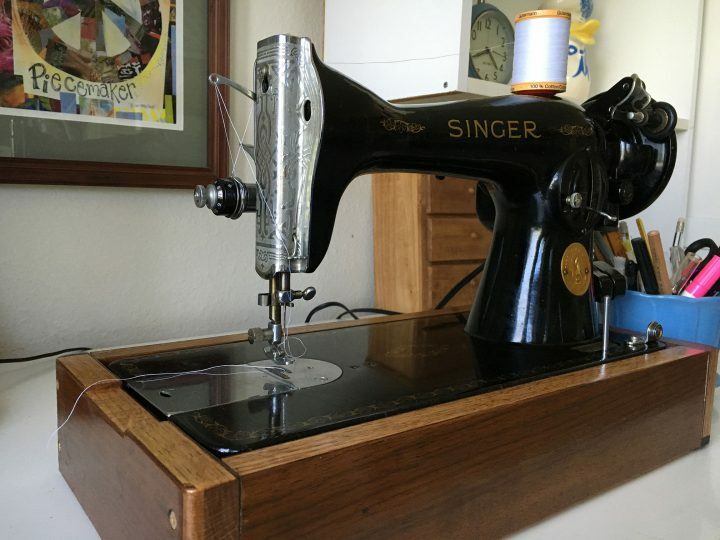 I used up almost every bit of the original panel pieces, so I used grosgrain ribbon for the neck and waist ties. 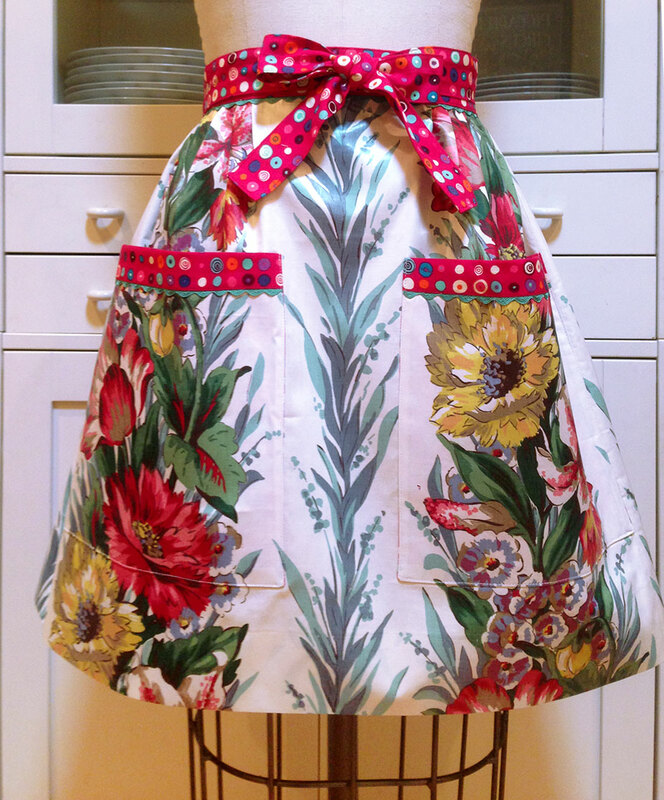 The back of the apron is lined with a Kona gold that matched perfectly, and it’s trimmed with green bias tape. 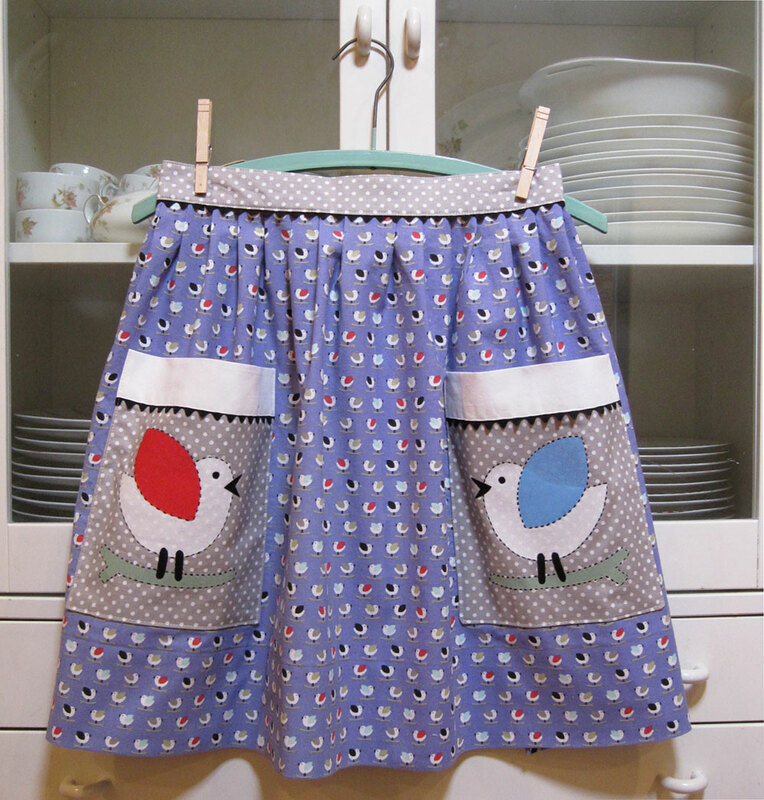 It’s an odd little Christmas apron, but I love it.